Harvey H. Jackson III focuses on the stretch of coast from Mobile Bay and Gulf Shores, Alabama, east to Panama City, Florida--an area known as the "Redneck Riviera." Jackson explores the rise of this area as a vacation destination for the lower South's middle- and working-class families following World War II, the building boom of the 1950s and 1960s, and the emergence of the Spring Break "season." From the late sixties through 1979, severe hurricanes destroyed many small motels, cafes, bars, and early cottages that gave the small beach towns their essential character. A second building boom ensued in the 1980s dominated by high-rise condominiums and large resort hotels. Jackson traces the tensions surrounding the gentrification of the late 1980s and 1990s and the collapse of the housing market in 2008. While his major focus is on the social, cultural, and economic development, he also documents the environmental and financial impacts of natural disasters and the politics of beach access and dune and sea turtle protection. 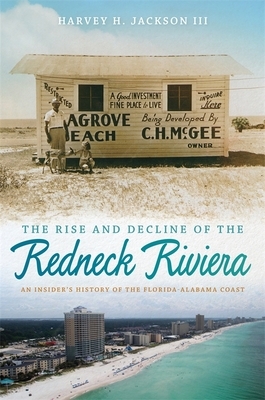 The Rise and Decline of the Redneck Riviera is the culmination of sixteen years of research drawn from local newspapers, interviews, documentaries, community histories, and several scholarly studies that have addressed parts of this region's history. From his 1950s-built family vacation cottage in Seagrove Beach, Florida, and on frequent trips to the Alabama coast, Jackson witnessed the changes that have come to the area and has recorded them in a personal, in-depth look at the history and culture of the coast. HARVEY H. JACKSON III is Eminent Scholar in History at Jacksonville State University. His many books include Lachlan McIntosh and the Politics of Revolutionary Georgia (Georgia), Rivers of History: Life on the Coosa, Tallapoosa, Cahaba, and Alabama, and Inside Alabama: A Personal History of My State.